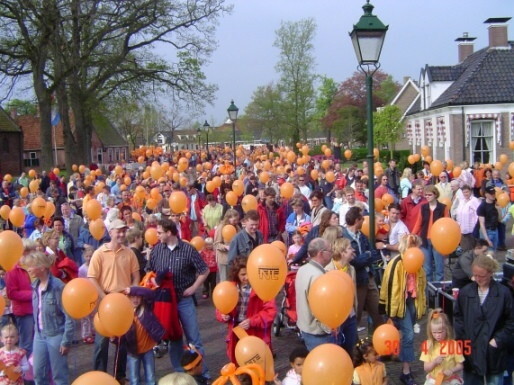 Voor alle de Nederlanders dat ik kent…..
Fijne Koninginnedag allemaal!! Ja ik zit hier in NY maar mijn hart is op de plein met mijn maatjes en een Amstel! I thought I would add an update as I now realize I have been in the US for 6 months – and it has just flown by. The things that frighten me about it are that it has gone so fast but mainly how quickly I have adapted and settled. I scarily find myself referring to things by their local as opposed to proper names (Trash Cans, Garbage – however and Arse is still an Arse!) and my attitude can be quite scarily New York – the worst being the whole ‘How are you’ thing and not meaning it – the platitude rather than a genuine enquiry. Still I guess when in Rome.. just kick me if I behave like that back in Europe. If you hadn’t known the place in Jersey was a temporary thing and I now live in Queens – Queens is undoubtedly the most civilized place in the world ever – I can walk 20 feet from my foot door at most times of the day and get a Weihenstephane and an Irish Breakfast, and should I desire to travel further for a Shepherds Pie or Fish and Chips and a pint of Guinness, there are no less than about 6 establishments within a 5 minute walk that cater to the very apparent Irish population that share the lovely village of Sunnyside, the particular area of Queens I reside in. Oh and add to that I can get proper Irish Bacon, Creme Eggs and Walkers Prawn Cocktail Crisps all just a 5 minute walk from here. The job is wonderful as well – my little Data Centre is growing and is firmly under my control – its something I am fiercely proud and extremely protective of. Its just under 2 months until it is supposed to be fully built out and have taken over NJ1 – the largest of the DC’s we are consolidating – but that’s going to be a push. And life itself? Well its pretty damn good so far. Life with my beautiful fiancee is wonderful, although we have our problems but she is very understanding and forgiving when I need her to be and all the while I am trying to be a good husband to be. No news as and when and where we will be getting hitched for sure, but fingers crossed it will be sooner rather than later. As well as that it seems financially moving here was the best thing I could have done – for the first time in my life I actually have a savings account – with money in it!! That’s all going towards a new appartment one day soon and most probably a car, but its an interesting concept actually having a little nest egg with money for a rainy day if need be. Then one day one of my bestest buddies – the sickenly talented darryn.r of TMO fame alerted me that our long running web partners web-mania had adopted a new policy of taking money and running – as opposed to supplying a service for which we give up our hard earned cash. Sure enough withing a couple of weeks of me already renewing my subscription amnas.com went to a holding page pending renewal – after I had already paid up. So Mr Barnes, thank you so much for giving me something to take all my time this bank holiday weekend – I am sure my beloved lady is much happier for the fact I have been kept away from paying her the attention she deserves. Also for improving my skills in SQL, PHP, WordPress as it was only proper hacking that could get my site back – and also for all those spare dollars you helped me shed by paying through the nose to onlinenic.com just to get back the property which was actually mine in the first place. I don’t suppose I will be of course seeing my 50 quid that I paid you back in March will I?